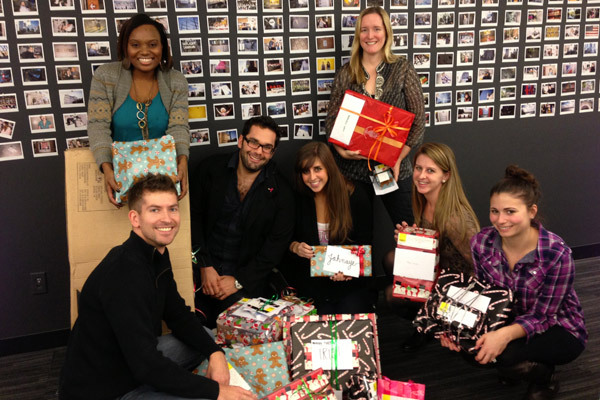 This winter, NYC-based global communications agency M Booth embraced the season of giving by participating in New York Cares' Winter Wishes program, which provides gifts to disadvantaged children, teens, and families to help make their holidays brighter. This winter, NYC-based global communications agency M Booth embraced the season of giving by participating in New York Cares' Winter Wishes program, which provides gifts to disadvantaged children, teens, and families to help make their holidays brighter. This past Friday, December 7, M Boothers held a letter writing and gift wrapping party to get into the holiday spirit together. More than 40 M Boothers participated in the program by writing and decorating heartfelt letters, shopping for the perfect gift for their child, and wrapping their presents. Gifts for younger children included board games, dolls and action figures, jewelry making sets, and even a bicycle, while over two dozen lucky teenagers will receive gifts including walkie talkies, Barnes & Noble and Amazon gift cards, beauty products, and more. Every year, New York Cares partners with hundreds of its Community Partners, including homeless shelters and other deserving nonprofit organizations, to provide gifts for families in need, many of whom would not otherwise receive gifts during the holidays.